The rapper will host the ‘Shady Fireside Chat’ on the same day as the release of his new album ‘Revival’. On the day of the release of his new album “Revival,” Eminem will host a live radio chat with fans and members of the media. The “Shady Fireside Chat” will air at 5 p.m. Friday on Eminem’s SiriusXM channel, Shade 45, SiriusXM announced Wednesday night. 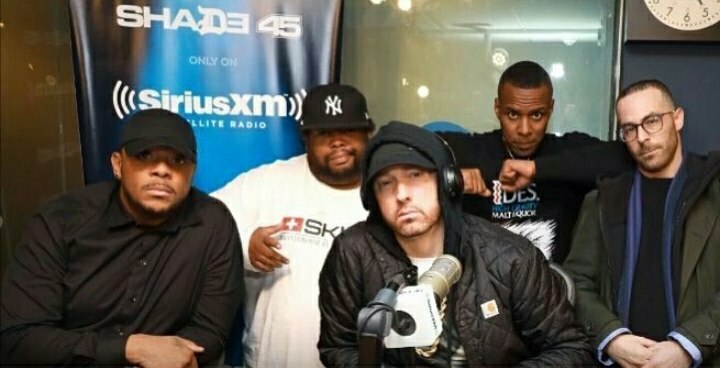 During the live broadcast, Eminem will talk about “Revival” and will take calls from listeners on the air from a studio in Detroit. Fans looking to participate can call the station at 888-SHADE45 (888) 742-3345) during the broadcast. “Revival” is Eminem’s first album since 2013’s “The Marshall Mathers LP.” It features tracks with Ed Sheeran, Beyonce, Pink and Alicia Keys, and its producers include Dr. Dre and Rick Rubin. In other Eminem news, the rapper will be hitting the road “on select dates” in 2018, his agent, Cara Lewis, told Pollstar this week. The performances will mark Eminem’s first U.S. concert appearances since 2014.